A pioneer of the Chinese democratic transition movement, Mr. Liu Xiaobo, passed away on 13 July 2017 in Shenyang, China because of delayed treatment of his liver cancer, at age 62. 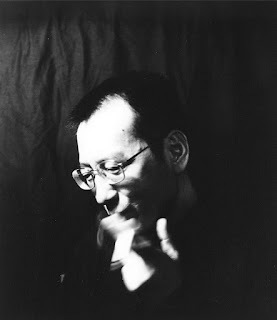 In the past thirty odd years Mr. Liu Xiaobo had been vigorously committed to the democratic transition of China; he had worked diligently [note 1] and painstakingly [note 2] for the cause of democracy, freedom and human rights of the people of China, and had been sent to prison four times with a total of 15 years. He was one of the most important voice of the contemporary freedom and human rights movement in China, and a monument that symbolised the Chinese people’s relentless struggle for freedom. Mr. Liu Xiaobo was born in Changchun, China on 28 December, 1955. In 1977 he was admitted as an under-graduate student to the Department of Chinese, Jilin University, and in 1982 he was admitted as a graduate student to the Department of Chinese, Beijing Normal University. In 1988 he earned his doctoral degree in Literature and Arts, and stayed on at the University as a teacher. He was the first doctor degree holder in Literature and Arts in contemporary China. In 1989, Mr. Liu Xiaobo participated in the June 4th democratic movement, and as a result was arrested and jailed. He was released in January, 1991. In May, 1995, Mr. Liu was arrested again for drafting “Appeal Letter on the 6th anniversary of June 4th”, and was released in February 1996. In October, 1996, he was thrice arrested for drafting “October 10th Declaration”, and was released in October, 1999. In between imprisonments he spent his time writing political commentary in Beijing. In December 2008 he was arrested for the fourth time for “Charter 08”, and sentenced to 11 years imprisonment. He was awarded the Nobel Peace Prize in 2010 while in jail. Mr. Liu Xiaobo was a forerunner in the Chinese Enlightenment Movement in the 1980s. During his studies, Mr. Liu had published numerous articles and made various public speeches, starting from the field of literature, moving towards culture and thoughts, and onwards to philosophy. His publications such as “Dialogue on Choice” and “Metaphysical Fog”, had elucidated the true meaning of freedom of thought and the pursuit of universal values. His doctoral thesis “Aesthetics and the Freedom of Human Beings” deepened our understanding of freedom on a philosophical level, and was a complete rejection of the communist ideology and regime. The ideas he proposed in the 1980s - democratization of politics, liberalization of economy, and diversification of culture – were way more advanced than the level of common understanding reached during the Enlightenment in the 80s. Mr. Liu Xiaobo was a witness and a survivor of the June 4th Democratic Movement. On the day following the publication of the April 26th Editorial [note 3] in 1989, and when signs of the subsequent military crackdown were emerging, Mr. Liu Xiaobo resolutely decided to give up his position as a visiting scholar at the Colombia University and headed back to the dangerous city of Beijing by himself. He immediately threw himself into the movement on Tiananmen Square; he wrote various public letters calling for the authorities to initiate democratic reform and issued the “June 2nd Hunger Strike Declaration”, gaining the trust of the students on Tiananmen Square. When the Beijing authorities sent out the military to suppress the democratic movement, Mr. Liu Xiaobo negotiated with the military on the early morning of June 4th, securing the safe passage of thousands of students right in front of the guns of the military, avoiding further bloodshed. He called himself the survivor and witness of the doomsday of communism. Mr. Liu Xiaobo was a guardian of the June 4th spirit. In the days following the June 4th Massacre, when everyone kept their mouths shut, Mr. Liu Xiaobo spent over a decade in the tireless collection of information for the Tianamen Mothers. He helped the Tiananmen Mothers in the drafting and editing of statements, in coordination, and in calling for both local and overseas media to pay attention to the plight of the Tiananmen Mothers. He was the most steadfast and dependable companion of the Tiananmen Mothers. Every year he would mark the anniversary of June 4th in his own way. He had also helped many who still suffered from having participated in the 1989 Democratic Movement, both materially and spiritually. Mr. Liu Xiaobo was the facilitator of the community of free writers in China. From 2003 to 2007 Mr. Liu Xiaobo was the First and Second President of the Independent Chinese Pen, and the chief editor of the online magazine “Democratic China”. Inspired by Mr. Liu Xiaobo, many young dissident writers joined the Independent Chinese Pen, and actively engaged in the freedom of speech and publication of writers inside China. Under Mr. Liu Xiaobo’s leadership, the Independent Chinese Pen leaned its focus inside China, forming a community of free writers based in Mainland China. The Independent Chinese Pen also successfully held prize giving ceremony for the Free Writing Prize in Beijing for two times, making it a significant civil organization. Mr. Liu Xiaobo was the leader of the Charter 08 Movement of China. Mr. Liu Xiaobo was the main reviser and organiser behind the Charter 08, and he almost paid for it with his life. Charter 08 is a political blueprint for future China, a constructive document on peaceful transition, and a collective stance of the civil society for a constitutional republic. Using his charisma and influence, Mr. Liu Xiaobo collected the first batch of more than 300 signatories of renowned individuals in the society. The Charter Movement was immediately and cruelly suppressed by the Communist regime, Mr. Liu Xiaobo shouldered the responsibility for everyone, was jailed as a result, and was subsequently awarded the Nobel Peace Prize in 2010. Mr. Liu Xiaobo was the most important social activist and independent intellectual in contemporary China. After the June 4th Massacre, he shouldered the task of organising an opposition movement in China. He was involved in human rights and rights defending movements; he was concerned about political prisoners, writers and family members of prisoners of conscience; he worked both within and outside the establishment and tried consciously to build a network of political opposition. He cared much about younger generation of writers and dissident intellectuals, and created conducive conditions for their development. He had given up his own academic research to actively intervene and voice out for the disadvantaged groups inside China. Mr. Liu Xiaobo was the most important political commentators in the contemporary Chinese speaking world. In the past twenty odd years, Mr. Liu Xiaobo had written many political commentaries on practical problems of China. Using his profound knowledge in politics and philosophy, he had written thorough, penetrating and enlightening analysis of the root of the problems facing contemporary China. He was at the same time a romantic poet, who wrote with elegance and ease. The pursuit of beauty and the pursuit of human freedom, have at their roots the same logic. To date Mr. Liu Xiaobo had already published 16 books. Mr. Liu Xiaobo was a martyr of the democratic transition movement in China. Persisting for over thirty years, he had lived out his values and beliefs despite the many obstacles and setback he had faced. In his own words, freedom is not about words but about action. With no freedom, there is no modern civilisation. The democratisation, modernisation and civilisation of contemporary China is the one thing that was always on his mind, and the cause that he had always been fighting for during every day of his life. As a result Mr. Liu Xiaobo had been awarded a total of 14 honours and prizes from around the world throughout the years, including the Hellman Human Rights Award. His contributions in paving the path as a trailblazer and inspiring the younger generation to carry on was second to none in the whole world. Mr. Liu Xiaobo was a moral giant in the tragedy of China. He had once stated, “In order that everyone can enjoy the right to be selfish, there must be one who sacrifices himself selflessly. In order to achieve negative liberty, one must have the determination to fight positively. The birth of a martyr would completely change the soul of a people.” Throughout the long years of mental suppression and physical imprisonment, Mr. Liu Xiaobo had only become all the more gentle, tolerant and humble, and this in turn made his ability to inspire others all the more powerful and far-reaching. Alas! The passing of Mr. Liu Xiaobo causes great grief to our people and our country. The Gods had withheld their blessings and taken away the one of pureness and sincerity. Because of his death, rivers and mountains have changed their colour, and the sun and moon have lost their light. Mr. Liu’s disease was a disease caused by imprisonment, and we shall record his deeds for him; Mr. Liu’s death was a death for China, and we shall carry on his fight. A China left behind by Mr. Liu is one which shall cry for him. Alas what great ambition there was, and we must mark it for remembrance. Reading the passionate words he had left behind, we issue this obituary to show our grief. Note 1. The idiom 宵衣旰食 literally means that one woke up before day break to work, and only eat after meal time is passed. Note 2. The idiom 嘔心瀝血 literally means working till one spits out one’s heart and drips out blood. Note3. The April 26th Editorial is a strongly worded editorial condemning the student movement then brewing in Beijing. Liu is the main writer who drafted in 2008 Charter 08, a blue print for a democratic China. Charter 08 was inspired by and modeled after Charter 77, a document for Czechoslovakia's democracy, written mainly by the late Czech President Václav Havel in 1977 and signed by a number of Czech intellectuals. Now Liu is in his last days, with multiple organ failures and breathing difficulty. Hereby, we would like to extend to you our heartfelt greetings and wishes of good health from the Czech Republic and express our support of your struggle to have human rights upheld in your country. We watch your activities with admiration and respect, and we see your persecution by the state authorities as unlawful and unjust.